This week long touring itinerary provides the perfect contrast between the coastal scenery of the north and rugged mountains of the interior. You will be treated to different landscapes every day! 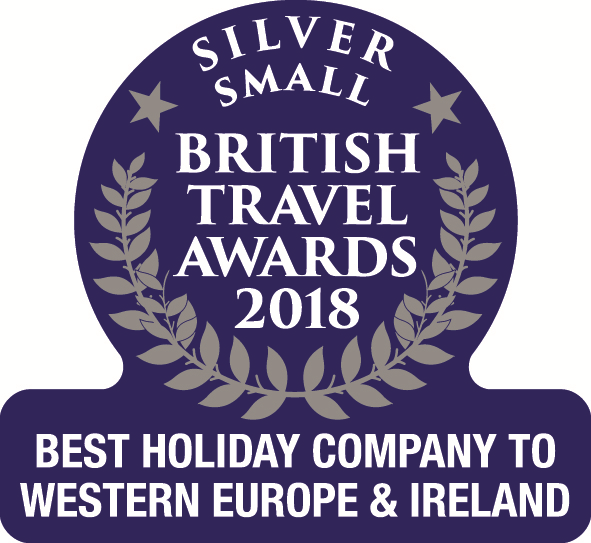 A great trip that will leave you with fantastic memories of Corsica and will make you want to return for more! Quaint rural villages, fragrant maquis covered mountains and thick chestnut forests are all part of this popular cycling tour. You will discover such varied landscapes from the high peaks of the interior to the breathtaking coastline of the north while meeting proud island inhabitants along the way. After arriving at Bastia airport, you will be transferred to your hotel in Bastia. If you have time to discover the capital of "Haute Corse", it's worthwhile visiting the old port and the citadel. From the old city there are wonderful panoramic views over the sea and surroundings. For dinner, we advise you to go to the old port which has a very lively atmosphere in the summer. This morning you'll pedal along the east side of the Cap Corse, only a stone's throw from the sea. You'll then cross the island to join the west coast of the Cap with its dramatic cliffs. The route is lined with Genoese and Paoline towers as well as old convents and mills. The landscape, including the small fishing ports, is splendid. Night stay in a small coastal village on the west coast of the Cap. Riding distances: a choice of two routes, approximately between 59km and 79km. Overnight in a charming village​ on bed & breakfast. Today you'll leave the Cap to pedal southward towards St Florent. 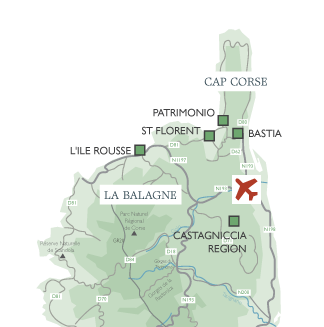 According to your chosen route, you will be able to discover the village of Patrimonio, famous in the whole of Corsica for its vineyards. Tastings are possible in the cellars of the village. In St Florent, do not fail to visit the citadel and to stroll around the marina and its cobbled streets and boutiques. Overnight in St Florent on bed & breakfast. Today you are in the heart of the Désert des Agriates. From hamlet to hamlet, you cross this superb 'desert' covered in the local maquis scrub (which has a fantastic smell and is amazing in the spring when the maquis is in blossom). Returning to the coast, you will soon arrive at your accommodation, not far from L'Ile Rousse. Cycling distance: a choice of three, approximately 48km, 69km or 80km. Overnight in a village near to L'Ile Rousse on bed & breakfast. Today you'll get to explore the pretty villages of la Balagne. This area is bewitching. The stone villages perched in the middle of nowhere have an astonishing beauty which hasn't changed with time. Cycling distance: 30km, 44km, or 57km. Overnight in the mountains on bed & breakfast. Cycling distance: 48km, 61km or 73km. Overnight near Ponte Leccia on bed & breakfast. Your last day of cycling will take you through the villages of the Castagniccia - known for their chapels and plentiful chestnut forests. Red Kites are widespread in this area; you are likely to see them hovering over your heads. You will cross many rivers and brooks before arriving at the coast. Cycling distance: 34km, 53km or 57km. Overnight near to Bastia on bed & breakfast. After breakfast, you will be transferred to Bastia Airport for your onward journey. This cycling trip ranks as a fantastic although fairly tough “leisure” cycling trip. There are many hills to climb. The easiest routes are the most direct – but these also include stretches along the main roads. To get the most out of the holiday, it is better to take the longer routes which are on quiet country lanes. A good level of fitness and stamina, plus regular cycling will be of benefit. Please note that this trip takes place on roads open to traffic. You should be competent with a bike on the road and you should not cycle at night. 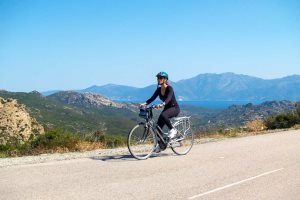 Whilst it is not a legal requirement to wear a helmet, we request all clients to wear a helmet at all times when cycling in Corsica. You can cycle at your own pace, choosing when and where to stop. We transport your bags between the hotels, provide maps and notes. This is a way of enjoying complete flexibility, you dictate the pace and rhythm of your holiday. Hybrid bicycles are included in the tour. These are a French brand. They are sturdy, solid and reliable and will definitely get you up those hills! They have an aluminium frame, 21 gears (shimano) and a comfortable Selle Royal saddle. They come in both men’s and ladies’ versions and are suitable for leisure cycling. Provided with a helmet, double back panniers, a handlebar bag (sometimes one between two), puncture repair kit, pump and a bike lock, the men’s versions have a water bottle cage, whereas the Women’s versions do not (but a water bottle can be carried in the panniers). Luggage transfers will be made daily. During the day, you should take a day sack (or use the panniers if you are renting a hybrid bicycle) for carrying your essential personal items like your camera, wallet, phone, water and lunch. It is important to consider that it may be necessary to carry your bags short distances at the start and towards the end of your holiday. You will need soft luggage. Be aware that ALL cycling in Corsica includes some hills! Be prepared to do some climbing. It is a good idea to get fit for this trip. The more time you put in before you leave, the more you will get out of it. Before your holiday you should practice to ensure you are able to cover up to 80km a day. You can expect to encounter some very wide ranging temperatures. During cycling you should be ready for everything, take powerful sun protection, as well as warm fleeces (depending on the time of year). Corsica is known for its micro climates and each valley can be very different. The weather can change quickly and the mountains generate some stormy, often unpredictable weather. A soft suitcase for your main luggage. 15kg maximum per person.